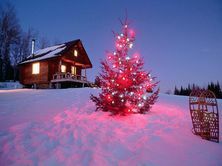 President of IDGCA Moshkov U., Director General Ognev M., the IDGCA team and its subsidiaries wish health, happiness and prosperity for you and your families in the New Year! On 26th December there will be held the solemn meeting of International Dangerous Goods and Containers Association's members. The agenda includes: summary report by Director General of NPMP "IDGCA" on the execution of a plan within 2008, yearly settlement and approval of the work plan on 2009. The meeting will close with the gala New Year and Christmas dinner for all the participants. The event will take place at the premises of International Staff Training Centre at an address: Strelna, Sankt-Peterburgskoe shosse, 47. 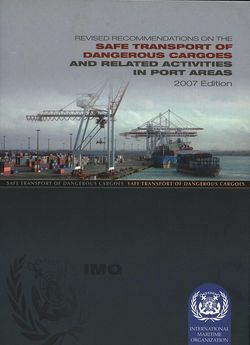 Under the aegis of International Maritime Organization (IMO) the new edition of International Maritime Dangerous Goods Code (IMDG Code), 2008 was issued, and all the changes by the amendment 34-08, which had been adopted by the Maritime Safety Committee in May, 2008, are contained in this edition. The new revision of IMDG Code was issued both as a printed publication and as an electronic publication. It's assumed to be possible to subscribe for receiving the electronic publication of the Code through Internet. NPMP "IDGCA" can assist in purchasing the Codes and other literature by IMO. To get more information, please call: +7(812) 740-20-19, 740-20-17 or address us by e-mail:info@idgca.org. Since the 26th of November till the 5th of December the 85th session of IMO Maritime Safety Committee (MSC) took place in IMO Headquarters in London. The Committee accepted International Maritime Solid Bulk Cargoes Code, which has a mandatory nature in accordance with the SOLAS Convention and comes into force on the 1st of January, 2011, as well as Code on lateral stability in undamaged condition. This Code should come into force on the 1st of July, 2010. The Committee had also approved amendments to the SOLAS Convention relating to compulsory use of Electronic Chart Display and Information Systems on ships with gross register tonnage more than 3000. The next step forward was given to the development of specific construction standards for oil tankers and bulk cargo ships. Also the number of amendments to the SOLAS Convention, Protocol 1988, International convention on load lines, 1966, International Management Code for the Safe Operation of Ships and for Pollution Prevention, International Code on Secure Carriage of Spent Nuclear Fuel in Containers, Plutonium and Wastes with a High-Level Radioactivity by Sea, International Code of Safety for High-Speed Craft, 2000, International Life-Saving Appliances Code. X International Conference "Multimodal Transportations of dangerous goods"
15-16 June, 2009 the X International Conference "Multimodal Transportations of dangerous goods" will be held in St. Petersburg. International experience of transportation of goods in freight containers of different types and transportation of dangerous goods in tank containers will take a spacial place in the programm of the Conference. Representatives of IMO and Sub-Committe of Experts on the Transport of Dangerous Goods have already confirmed their participation in the Conference. The previous Conference was held successfully 3-4 June, 2008 in St. Petersburg, in Baltic Star Hotel and was appreciated by representatives of international organisations, authority and business. 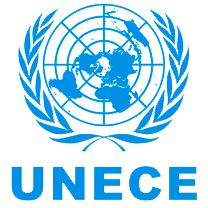 The UNECE Sub-Committee of Experts on the Transport of Dangerous Goods will hold it's 34th session from the 1st to the 9th of December 2008 in Geneva. The coming session will complete another biennium of sessions of UNECE Committee of Experts on the Transport of Dangerous Goods and Globally Harmonized System of Classification and Labeling of Chemicals. During the session the Sub-Committee will consider consolidated list of amendments to "Recommendations on the Transport of Dangerous Goods - Model Regulations", adopted during the sessions of the latest biennium. Also there will be discussed questions relative to the classification, packing of dangerous goods, limited quantities, electronic data interchange, harmonization of rules of transportation of radioactive materials with IAEA rules, global harmonization of rules of transportation of dangerous goods with UN Recommendations. The experts are also to discuss and adopt the programme of work for the biennium 2009-2010. The representatives of NPMP "IDGCA" will take part in the work of the Sub-Committee. On the 13th of November, 2008 the session of the RSPP Committee on Transport will take place under the chairmanship of OJSC Russian Railways president, V.I. Yakunin. 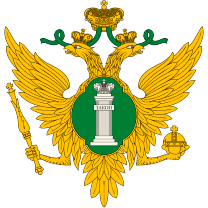 - draft federal laws on introduction of amendments to the Federal Law "Regulations for Railway Transport in the Russian Federation". Director General of NP "IDGCA", M.I. Ognev, will take part in committee work. 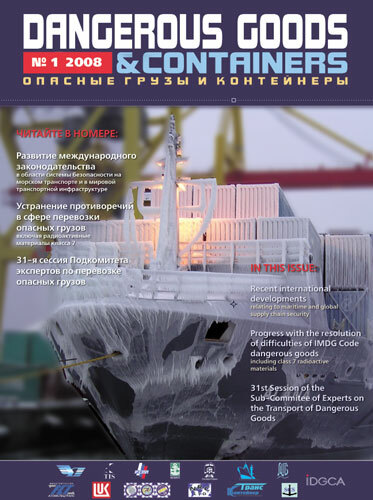 А new issue of the magazine "Dangerous Goods and Containers"
In November a new issue of the magazine "Dangerous Goods and Containers" will be out of print. - International Convention for Safe Containers: international and Russian practice of CSC fulfillment. 10-14 November the regular session of IMO Council will take place in London. In accordance with the Convention on the International Maritime Organization, 1948 the Council is one of the principal authorities responsible for adoption of conventions and introduction of conventions into international practice. The Council consists of 40 Member States, which are being elected by the Assembly, and governs the Organization during the period lasting between sessions of the Assembly. The session of the Council will proceed in accordance with the adoptedAgenda. 6-7 October the conference devoted to B.I.C. 75-th anniversary was held in the hotel "Corinthia" on Malta. The conference was attended by the representatives of National Registration Organizations (NRO) and the representatives of container business from all over the world. The participants of the conference visited container terminal Malta Freeport which is the largest Mediterranean hub. A wonderful friendly guest-night organized in the ancient knights' castle, let the participants feel the hospitality of kings. NP IDGCA in the person of Director General M. Ognev thanked Michel Hennemand, B.I.C. President, and the providers of the conference for the invitation to the conference and their hospitality. The detailed review of the conference and the associate events will be published in the following issue of "DG&C". Since 20th till 24th of September in IMO head-office in London (4 Albert Embankment) was taking place the 13th session of IMO Subcommittee on dangerous, solid goods and containers (DSC 13). At one time, on the 23rd of October, a state reception on the occasion of celebrating of The World Sea Day and 60th anniversary since IMO flotation day took place in IMO edifice. Mr. Mitropulos, Secretary general of International Maritime Organization, received a visit in his study from Director general of Non-Commercial Partnership IDGCA Mr. Ognev, where the conversation relative to the activity of the Association and it's possible making contribution into the problem of increasing of safety and environment protection was held. October, 6 and 7 the Conference on New Challenges to Trade devoted to the 75th Anniversary of the Bureau International des Containers (B.I.C.) will take place on Malta. M. Ognev, IDGCA General Director, was invited to take part in anniversary celebration. B.I.C. was established in 1933 in order to make business people sensitive to the development of international transport and containers and their practical aspects. At the present time container owners use services of B.I.C. all over the world. The first years of it's existing B.I.C. mostly used to address itself to the problems of inland transport (rail and road). But rather soon after the Second World War it became fully intermodal and thus adopted its present title. B.I.C. plays the key role in the development of the international transportations and containers. B.I.C. in association with ISO deals with such matters as: technical control, strength, coding, identification and marking of containers and more generally the facilitation of commercial exchanges. In 1970-s at B.I.C. instigation the system of alphanumeric container marking was introduced and well-structured and dependable register of container owners 'BIC-CODE' was worked out. The considerable contribution was made by the Bureau to the development of the main international conventions related to containers, particularly: the Customs Convention on Containers (C.C.C.) in 1972; the International Convention for Safe Containers (C.S.C.) in 1972; the International Road Transport Convention (T.I.R.) in 1975; the Customs Convention on the International Transit of Goods (I.T.I.) in 1985. Nowadays B.I.C. numbers 1200 members and joins together all the participants of transport industry who are interested in containerization of goods and development of multimodal transportation. 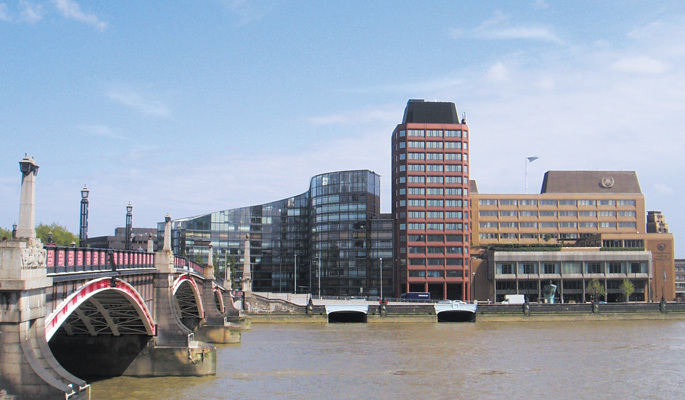 From 22nd to 26th of September, in London, there will be held the Thirteen session of the IMO Sub-Committee on DSC. Provisional Agenda for the 13th session contains such main topics as: amendments to the IMDG Code and supplements, including harmonization of the IMDG Code with the UN Recommendations on the transport of dangerous goods, amendments to the IMSBS Code, including evaluation of properties of solid bulk cargoes, amendments to the CSS Code and extension of the BLU Code to include grain, casualty and incident reports and analysis. Other topics which will be also discussed during the session are: guidance on providing safe working conditions for securing of containers, guidance on protective clothing and Recommendations on the safe use of pesticides in ships. M. Ognev, IDGCA General Director, will take part in work of the session as a member of Russian delegation. Full information about work of the 13th session will be published in the "Dangerous goods and Containers" N4/2008. 16th September in Ministry of transport a meeting of members of the Russian delegation on discussion of the IMO Sub-Committee on DSC (22-26 September, London) will be held. M. Ognev, IDGCA General Director, will take part in the meeting. - "Americans Enhance the Image of the Dangerous Goods Professional". Interview with L. Curie, Administrator of COSTHA. Three following issues will be issued since October 2008 to January 2009. The staff of IDGCA and all members of the Partnership congratulate the President of the Partnership Gennadiy Moshkov on his Birthday and wish him strong health, happiness in his family life and every success in his interesting and versatile work. 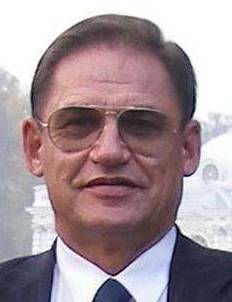 Michael Ognev the "International Dangerous Goods and Containers Association" Director General celebrates his Birthday on 27th of August. 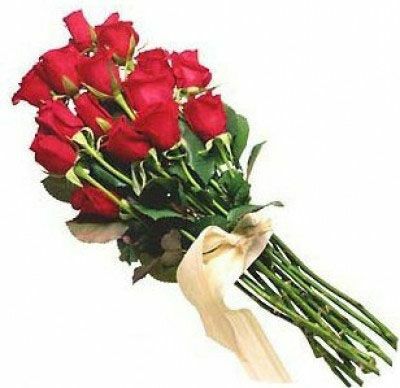 The stuff of IDGCA congratulates Mr. Ognev on his Birthday and wishes him health, happiness and every success in his demanding work. Dear Mr. Ognev, we wish you vital forces and endless creative energy. During the period from 11th till 15th August International Staff Training Centre (ISTC) held a seminar on training of maritime oil-gas field arrangement managers. The program of the seminar included study of the international and national regulatory system in the area of engineering, constructing and exploitation of maritime oil-gas constructions (MOGC), indoctrination with safety standards and regulations when working at shelf, including indoctrination with ISO 29000 standard, IMO requirements and regulations of classification societies. Besides the specialists of ISTC, officers of Russian regulatory bodies, members of scientific research institutes and leading enterprises of the branch were included into the instructional staff. At the invitation of Non-Commercial Partnership IDGCA, Mr. Irfan Rahim, the Head of Cargoes Section of the Maritime Safety Division IMO took part in the seminar and reported about IMO documents related to safety ensuring when executing works at off-shore areas. 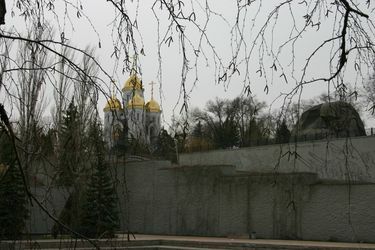 Besides holding lections, off-site studies in shipbuilding and marine engineering research and development centre of Central Scientific Research Institute named after academician A. N. Krylov and in All-Union Scientific Research Hydrotechnical Institute named after B. E. Vedeneev were hold for the trainees. Representatives of the following major Russian and international companies took part in that seminar: McDermott Caspian Contractors, Inc., "Production association "Belorusneft"" Republican Unitary Enterprise, "Lukoil-Kaliningradmorneft" Ltd., "National Bureau of Expertise" Ltd. The seminar was highly praised by the trainees. International Personnel Training Centre receives applications for training of specialists on this course. You can send your application by tel. : (812) 740-20-19, 740-20-17, 421-54-51 or by e-mail:info@idgca.org,istc@idgca.org. The 16th of August the International Dangerous Goods and Containers Association celebrated it's 7th Birthday. Non-Commercial Partnership International Dangerous Goods and Containers Association which was registered in 2001 unionized representatives of large-scale industrial, transfer, scientific, expert, insurance and designing companies and organizations, and up to date it finds 20 full members. During the lifetime of the Association it's main and permanent tasks were and remain the protection of it's members interests, cooperation with international organizations (IMO, ISO, UNCTAD, Economic Commission for Europe), harmonization of national and international rules and guidelines, organization of seminars and symposiums, training of specialists. The international level of Non-Commercial Partnership IDGCA is determined by it's consultative status in UNECE Expert Sub-committee on transport of dangerous cargoes, as well as by publishing of international bi-lingual magazine "Dangerous Cargoes and Containers". The inherent thing of the Association activity is it's independence of any federal authorities influence, openness of it's assertions and opinions on different aspects of transport policy. From the date of it's birth Non-Commercial Partnership IDGCA met not only approval of it's activity from government authorities, but also had to face open countering the development of the organization from individual functionaries. And these days the Association celebrates not only it's birthday, but also the third anniversary of ordered police check which was organized against Non-Commercial Partnership IDGCA in September, 2005, and which brought moral and financial damage both to the Association, and to associated companies and to the members. In spite of heavy stages of development, Non-Commercial Partnership IDGCA celebrates it's 7th Birthday feeling confident about the future, assigning new tasks and assisting business to develop in virtue of law compliance, professionalism and healthy competition. The direction of Non-Commercial Partnership IDGCA compliments all the members of the Association, it's president G. Y. Moshkov and the personnel on this celebratory date and wishes luck in achievement of set goals. Mr. Irfan Rahim, Head of Cargo Section, International Maritime Organization was in St.-Petersburg to deliver a lecture on IMO and offshore oil and gas platforms. Mr. Rahim also visited the office of NP IDGCA and presented Mr. Michael I. Ognev, Director-General IDGCA an official copy of the International Convention in Safe Containers, 1972, as amended, in the Russian language. During his visit to Russia Mr. Rahim together with Mr. M. Ognev have also went to Novgorodskaya Oblast and highly appreciated beauty and greatness of this ancient Russian land. IDGCA would like to thank Mr. Rahim for the visit and for all his support to the Association and the magazine "Dangerous goods and containers" and wish him every success in his demanding work. On the 13th August Nikolay Malykh the "Manufacturing Corporation URALVAGONZAVOD" Director General is celebrating his 60-th jubilee. The members of NP IDGCA, the officials and the personnel of the Association congratulate Mr. Malykh and wish him strength and energy in his work in behalf of development of the organization he leads. We also thank Mr. Malykh for all the help and support which he provides to the Association. 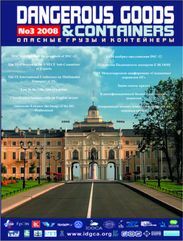 The official edition of International Convention for Safe Containers, 1972 is issued in Russian. This Convention is the fundamental regulatory document relating to the safety of freight containers and it formulates methods of testing and appropriate requirements for strength of containers as well as determines unified international rules of safety and procedures, which provide unobstructed movement of containers in international transport. IDGCA thanks Ministry of Transportation of Russian Federation and IMO, which, after IDGCA had applied with request to expedite the work on the issue of Russian edition, accomplished that task swiftly. Special thanks the Association express to Mr. I. Rahim, the Head of Cargoes Section of IMO Maritime Safety Division. The new Russian edition includes the Convention itself, Recommendations on it's harmonized explanation and interpretation as well as Amendment to the Convention approved by Resolution А.737(18) dated the 4th of November, 1993. Two companies with a right of deciding voice have joined the IDGCA: "Sandvik Mining and Construction" and "New Technology in Transportation". Sandvik is a global industrial group with advanced products and world-leading positions in selected areas - tools for metal cutting, machinery and tools for rock excavation, stainless materials, special alloys, metallic and ceramic resistance materials as well as process systems. The Group had at the end of 2007 about 47,000 employees and representation in 130 countries, with annual sales of more than SEK 86,000 M.
Sandvik Mining and Construction is a business area within the Sandvik Group and a leading global supplier of machinery, cemented-carbide tools, service and technical solutions for the excavation and sizing of rock and minerals in the mining and construction industries. Annual sales 2007 amounted to about SEK 33,100 M, with approximately 15,200 employees. New Technology in Transportation was founded in 2001 and is based in Moscow, Russia. The main activity of the company is implementation in usage special flexible containers МК-14-10 with max. available weight 14 tones and forwarding of bulk cargoes on the territory of former USSR. New Technology in Transportation has long established contacts with the main chemical manufacturers in the CIS. 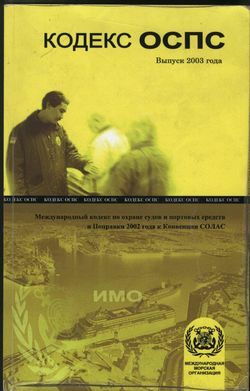 Russian-language edition "IMO Recommendations on the Safe Transport of Dangerous Cargoes and Related Activities in Port Areas"
The latest 4th edition of "Revised Recommendations on the Safe Transport of Dangerous Cargoes and Related Activities in Port Areas" translated into Russian is being prepared for publication by IDGCA. The Recommendations were first published in 1973 and afterwards were republished triply. At the present time the 4th edition, 2007 is being used. 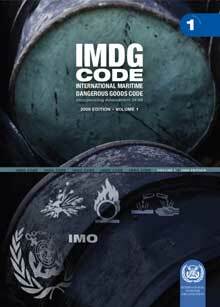 The Recommendations are agreed upon the provisions of the relevant IMO codes, in particular upon International Maritime Dangerous Goods Code (IMDG Code), and are widely used by harbor masters when drafting port by-laws, as well as by administrations of flags when working out national legal documents. A short glossary of terminology, which may be met when operating with dangerous substances in port areas, is published in the Appendix to the Recommendations. You can send acquisition orders for the edition to The International Personnel Training Centre. E-mail: info@idgca.org, phone/fax: (812) 740-20-19, 740-20-17. Order documents relative to meeting the requirements of "International Ship and Port Facilities Security Code", "Transport Safety Law" and RF Government Regulation on "Realizing of Chapter XI-2 of International Convention SOLAS, 1974 provisions and International Ship and Port Facilities Security Code provisions", were issued in 2008 by RF Department of Transportation and Federal Marine and River Transport Agency. 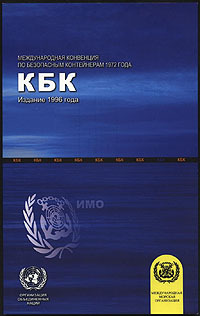 In particular, Order № 42 on "Approval of the determination sequence of organizations, which are authorized in area of security for ships flying the national RF flag and for port facilities", which spells out approval procedure of "organizations, which are authorized in the field of security". The present order document requires clarifications and commentaries from RF Ministry of Transport as the definitions used in this document and declared requirements comply International Ship and Port Facilities Security Code incompletely. Resorts from subjects of transport business, who are beware of wrong interpretation of these documents by bodies of government at the local level, are coming in to the address of IDGCA. The order by Federal Service for Ecological, Technological and Atomic Supervision dated the 29th of February, 2008 N 112 of "Approval of administrative regulations by Federal Service for Ecological, Technological and Atomic Supervision on the execution of state function on issue of permit for appliance of certain kinds (types)of technical devises at hazardous production facility" came into effect on the 4th of June, 2008. 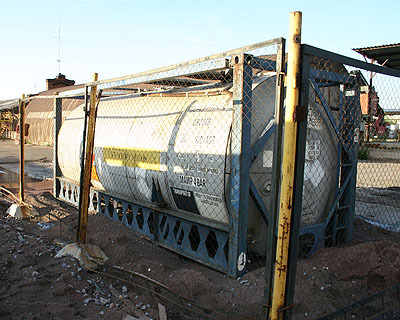 The effect of the regulations also extends to tank containers used for transport of dangerous cargoes. 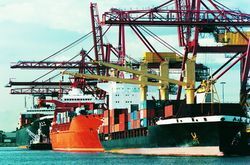 In this connection, many container owners had to face a long procedure of receiving permits for appliance of tank containers, and, as consequence, to face unproductive downtime of handling equipment. During the XI International Conference "Multimodal transportations of dangerous goods", which took place in Saint-Petersburg, the authorities of IDGCA brought to Russian Technical Supervisory Authority representatives notice the necessity of simplification of the procedure on the receiving of permits for appliance of tank containers, which already carry a certificate, confirming the compliance of handling equipment to international and national requirements in the field of safety. In May 2008 nonprofit organization"Chrysotile association" joined the IDGCA. Chrysotile association is a large organization which consolidates about 50 companies interested in production and use of chrysotile asbestos. Experts of the Chrysotile association together with experts of the IDGCA will take part in work of the 33rd session of the UN Sub-Committee of Experts on the Transport of Dangerous Goods which will be held in Geneva, 30 June - 09 July, 2008.
success in your business and cheerful holiday mood. 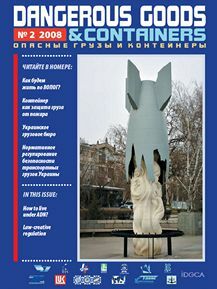 A new issue of the magazine "Dangerous Goods and Containers"
-"All are equal on the road as well as in the face of God".Interview with V. Chouvalov. V. Tsikhiseli, the Deputy Director of the IDGCA, the Director of the International Staff Training Centre. During the meeting there were discussed the question of cooperation of the IDGCA with the Minisrty of Transport in the field of development of marine safety legislation, IDGCA's participation in the work of international organizations as member of RF delegation and providing of conditions of sound competition in the sphere of services on marine transport. 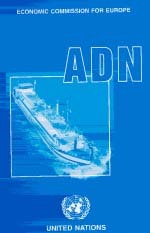 On 31 January 2008, Germany ratified the European Agreement concerning the International Carriage of Dangerous Goods by Inland Waterways (ADN), bringing the number of Contracting Parties to seven. The ADN entered into force. The annexed Regulations will become applicable one year after, i.e. on 28 February 2009. By now ADN has been ratified by Austria, Bulgaria, Germany, Hungary, Luxembourg, Moldova, the Netherlands and the Russian Federation. Other States (Croatia, Czech Republic, France, Italy and Slovakia) have signed the Agreement and are expected to ratify it in the near future. A new issue of "Dangerous Goods and Containers"
The Library of the International Maritime Organization has subscribed to the magazine "Dangerous Goods and Containers". Read in the next issue of "DG&C" the congratulatory address of IMO Secretary-General E. Mitropoulos devoted to IMO 60-th Anniversary. № 2-2008 will be out of print in May. For the years of existence of IMO there have been signed more than 40 conventions and reports, adopted more than 800 codes and recommendations aimed at rising of sea safety, prevention of sea accidents, environment and human lives. 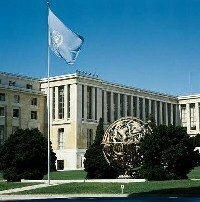 More than 300 experts from different countries of the world work in committees and subcommittees of the International Maritime Organization, providing duly consideration, of questions of safety on the sea and distribution of the information about adopted international norms and standards in this area. The International Dangerous Goods and Containers Association congratulates IMO Secretary-general Adm. E. Mitropoulos, employees of IMO and everyone who takes part in work of the International Maritime Organization, wishes successes in their responsible work and achievement in their main task - safety of navigation and cleanliness of the world ocean. The International Maritime Organization (IMO), paying the big attention of safety of transportation of dangerous goods sea transport, has made a decision on compulsion ofpreparation of shore-based personnel engaged in the transport of dangerous goods. According to requirements of chapters 1.3 and 1.4 International codes of sea transportation of dangerous goods (IMDG Code), European agreements ADR / ADN / RID, Agreements SMGS and positions of the Governmental orders of the Russian Federation from 15.03.2006. №134 and from 13.08.2006. № 490, necessary for reception of the license. On February, 7th, 2008 session ofthe Commission on transport of Advice RSPP on competitiveness and branch strategytook place in Moscow under the leading ofthe president of Open Society RZHD V.I. 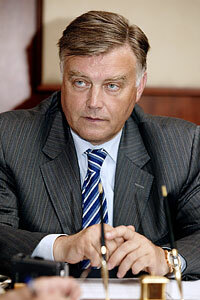 Yakunin. The basic theme of reports and performances were the questions, concerning technical regulation in transport branch.The deputy minister of transport of the Russian Federation Misharin A.S. has taken part in session of the commission discussion of the questions, concerning new changes in the law on technical regulation problems of application in territory of the Russian Federation of the international standards on production and their finishing up to the enterprises and the organizations have been lifted. General director IDGCA Ognev M.I., being a member of the given commission, has paid attention gathered on necessity of wide illumination of the international Conventions, agreements and the codes ratified by the Russian Federation. For deeper studying the given problems there was created the working group under the leading of the president of the Russian Union of Autoinsurers of A.S.Kigima. In February a new issue of magazine "Dangerous goods and containers" is out of print. IX international conference " the Mixed transportations of dangerous goods "
" the Multimodal Transportations of dangerous goods "
We invite all the interested companies to take part in conference. The operator of conference is the International Stuff Training Centre. It is possible to direct forward orderings by e-mail: info@idgca.org and by fax: +7(812) 740-20-19.